In all honesty, I’m not sure know how this book escaped my notice for so long. But it did. Somehow. I first ran across it several weeks ago, at Costco (of all places). Even though I didn’t know quite what to expect, I picked up a copy… and it turned out to be one of the finest war books I’ve ever read. A finalist for the 1990 Pulitzer Prize, The Things They Carried is not a novel, nor a memoir, nor a short story collection: it is, instead, an exquisite combination of all three. Through this unique but effective merging of fact and fiction, the author paints a picture of his life (and the lives of his fellow soldiers) before, during, and after the Vietnam war. And what a picture it is. O’Brien’s book is less a straight-up battle account and more a meditation – a meditation on courage and cowardice, life and death, imagination, memory, the nature of war, and ultimately, the power and potency of storytelling. Like a fabric, it’s an interweaving of the beautiful with the obscene, the graphic with the poignant, the disturbing with the surreal. 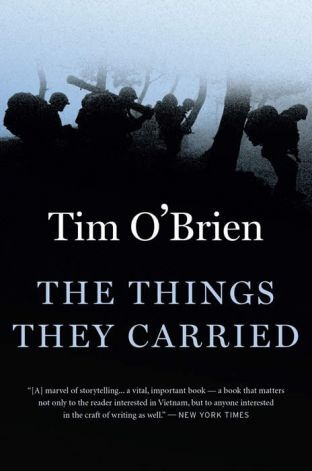 In my opinion, The Things They Carried is not only a must-read for lovers of war literature, but also for those (like myself) who wish to study the art of writing. At one point, O’Brien pauses to remind the reader that “a true war story, if truly told, makes the stomach believe.” This book does that. Violence is graphic. Language is harsh. And some of the imagery is singularly nightmarish. So if there’s one warning I would give to potential readers, it would be this: prepare to be jarred out of your comfort zone. But it’s worth it. Believe me, it’s worth it. Hmm…I might need to acquire this piece then.